What’s not to love about Australia Day? Especially this year as we get a long weekend. Yay! 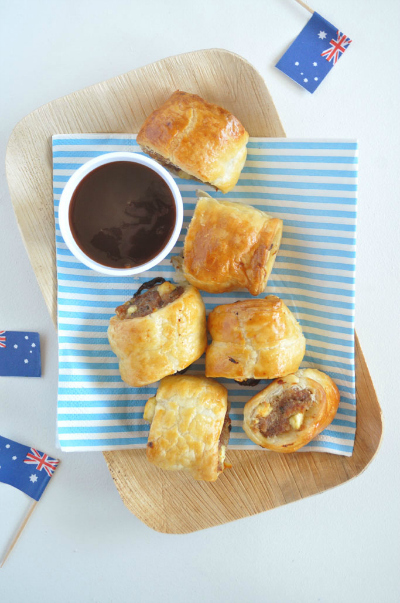 And to celebrate, I am going to be whipping up a batch of my tasty Australian-themed sausage rolls. The combo of sweet mint jelly, rich lamb and salty feta works a treat. In this scene: Eco rectangle plates. Striped napkin and paper flags from $2 shop. Preheat oven to 200°C conventional/180°C fan-forced. Place the lamb, sausage, breadcrumbs, mint jelly, mint leaves, feta, egg, garlic and Worcestershire in a bowl and mix well to combine. Divide the mixture into 6 and spread along the edge of each piece of pastry. Roll up to enclose. Cut each roll into 6 pieces and place on baking trays lined with baking paper. Brush with the extra egg and bake for 30 minutes or until golden and cooked through. Serve with barbecue sauce. oOo Freeze any uncooked sausage rolls in an airtight container or snap lock bag for up to 3 months. You can cook them from frozen, just increase the cooking time slightly. oOo Place the rolls seam-side down on the trays to ensure they stay sealed when cooking. How will you be celebrating this Australia Day? 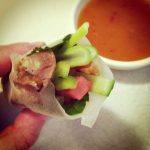 this is a gr8 recipe ….